Thirty-nine readers love this post. DrinkWire is Liquor.com’s showcase for the best articles, recipes and reviews from the web’s top writers and bloggers. In this post, Jason Walsh offers a rum cocktail recipe. I designed this cocktail to demonstrate how rum can replace whiskey in a cocktail and even provide new depth to a beloved classic such as this. This is my rum version of the classic Blood and Sand cocktail, which really highlights a new perspective on this classic gem. Cruzan blackstrap rum and Plantation overproof O.F.T.D are substituting for scotch in this case. Other then that it’s all the classic components. The blackstrap rum adds a refined molasses flavor to the beverage. 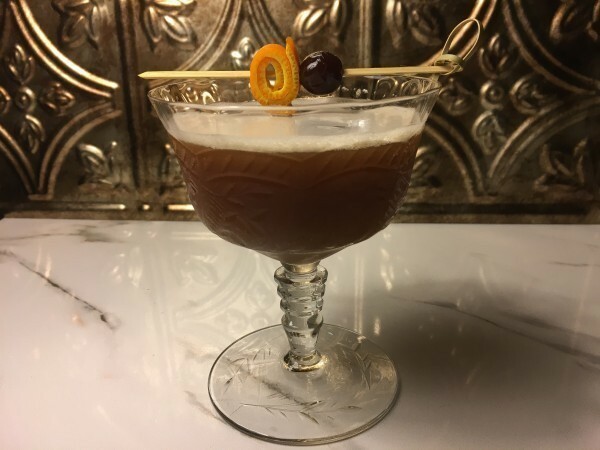 The overproof rum adds even more classic tropical notes and increases the ABV of the beverage to keep in check and balance the sweet power of the cherry heering and rich blackstrap rum. Cocchi Torino Italian style vermouth provides a heavier mouth feel to the mix and the OJ plays its traditional role by adding a touch of soft citrus. However, this particular OJ is a bit unique as I use a freeze concentration method to increase the OJ’s flavor power and impact to the cocktail. This can be achieved by juicing fresh orange juice and then freezing it in a ziplock bag. Once frozen, cut a hole in one corner of the bag and place the bag over a strainer and bowl. The resulting liquid leaves water ice behind which results in a more concentrated orange juice.